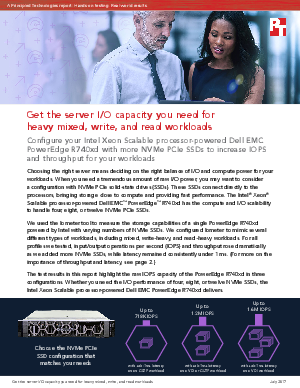 Choosing the right server means deciding on the right balance of I/O and computer power for your workloads. When you need a tremendous amount of raw I/O power, you may want to consider a configuration with NVMe PCIe solid-state drives (SSDs). These SSDs connect directly to the processors, bringing storage close to computer and providing fast performance. The Intel® Xeon® Scalable processor-powered Dell EMC PowerEdge™ R740xd powered by Intel® Xeon® Platinum processor has the compute and I/O scalability to handle four, eight, or twelve NVMe PCIe SSDs.